Ann Bancroft, the first woman to travel across the ice to both the North and South Poles, will speak at Wake Forest University at 7 p.m. Monday, April 20, as part of National Science and Technology Week. Bancroft’s lecture, in Pugh Auditorium of the Benson University Center, is being sponsored by The Western Triad Science & Math Alliance, an affiliated program of Wake Forest University. The lecture is free and open to the public. Jackie Hundt, the alliance’s director, said that seating is limited and will be on a first-come, first-served basis. A former Minneapolis school teacher, Bancroft is considered one of the world’s preeminent polar explorers for her Arctic expeditions. In 1986, she was the only woman on the Steger International Polar Expedition to the North Pole. 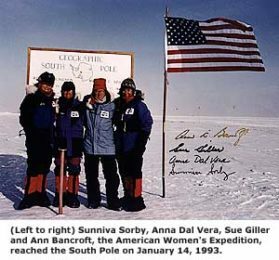 She led the American Women’s Expedition (AWE) — a group of four American women who skied over 660 miles, pulling 200-pound sleds to reach the South Pole on Jan. 14, 1993. The expedition’s goal was to highlight the strengths and achievements of women as well as educate thousands of students about the environmental challenges in Antarctica. For more information on Bancroft’s program, call Hundt at The Western Triad Science & Mathematics Alliance at (336) 748-5900.